Art lives. The rich and pompous spend their time ogling over exquisite pieces of art on the beaches of Miami and the posh spots of Los Angeles. For some, like art critic Morf Vandewalt (Jake Gyllenhaal), his job has turned way too personal, using his words to further some careers and kill others. For others, such as art gallery owner Rhodora Haze (Rene Russo) and personal assistant/protégé Josephina (Zawe Ashton), the paintings and exhibits represent little more than the next big payday. And of course, there are the artists themselves who are either trying to find that spark they once had (John Malkovich) or hold on to their morality in the face of smiling facades (Daveed Diggs). This art world gets turned upside down when the quiet neighbor of Josephina dies, leaving behind a treasure trove of work that the assistant gobbles up. Immediately, she and Rhodora reap the rewards of this enigmatic elder known as Dease. His work is beautiful…and, somewhat disturbing. As Morf researches who this Dease is, what he eventually finds is beyond interpretation. Art is original. After helming three films, one thing that cannot be said about director Dan Gilroy is that he’s lacking for authentic ideas. Whether it’s a lawyer with some peculiar personality traits in Roman J. Israel, Esq, or a man delving deep into the dark morass of news obtainment in Nightcrawler, those two movies were unique character studies in different ways. And yet, they’ve got nothing on his latest, Velvet Buzzsaw, all at once transfixing and perplexing. If Velvet Buzzsaw shows us anything, it is that the world of contemporary art could be ripe for film exploration. Save for Nocturnal Animals, there’s not anything quite like this movie (though the similarities are more tangential than concrete). With all of its intricacies, shallowness/depth, self-importance, etc., there’s a lot to mine; specifically, what makes art art, what spurs people to create it, and how it should be consumed and distributed. Kind of heady questions. Those questions, along with the general unpredictability of the script (to an extent) gives Velvet Buzzsaw enough color to stick with it until the end. Art is (sometimes) pretentious. 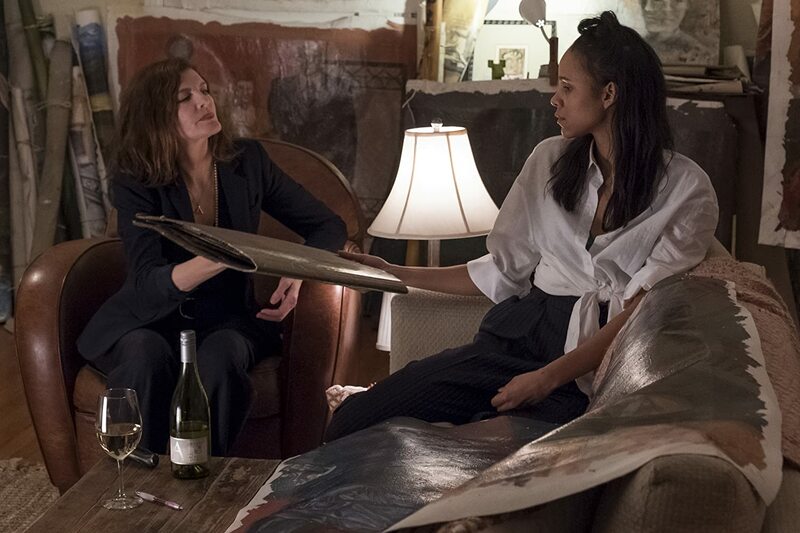 There’s much that has been made of Velvet Buzzsaw sharing the same vibe and satirical setup of Robert Altman’s classic in The Player. It’s hard to see, partly because the art world doesn’t lend itself to the same familiarity Hollywood does to the average audience. The feeling is had here that with a couple of story revisions, Gilroy’s feature could have sustained the interest that it builds through its first half to the conclusion. As it stands, the second half goes down a route that Velvet Buzzsaw never recovers from, a rote hybrid of a basic Final Destination flick and the “images have power” idea that Sinister did ten times better with stronger technical direction. Gilroy shows flashes of the high-level skill he displayed in Nightcrawler, but man, let’s thank our lucky stars that no actual money was spent viewing this on the silver screen. Despite the star-studded cast, this resembles a basic television movie instead of a wide release theatrical one. Even in the biggest of casts, the presence of Gyllenhaal is the largest attraction. Once again, he’s nothing but utterly convincing and magnificent in the role of a bisexual critiquer of art, nailing everything from the mannerisms to the erudite ramblings of why a piece does or doesn’t work. I’d be all for a documentary of him hopping from gallery to gallery to give his thoughts. The names that appear alongside him are, again, full of clout in Russo, Malkovich, and Toni Collette, along with up-and-comers Diggs, Billy Magnussen, and Zawe Ashton. However, almost all are window dressing to a story that starts to feel like a slasher by the midpoint. 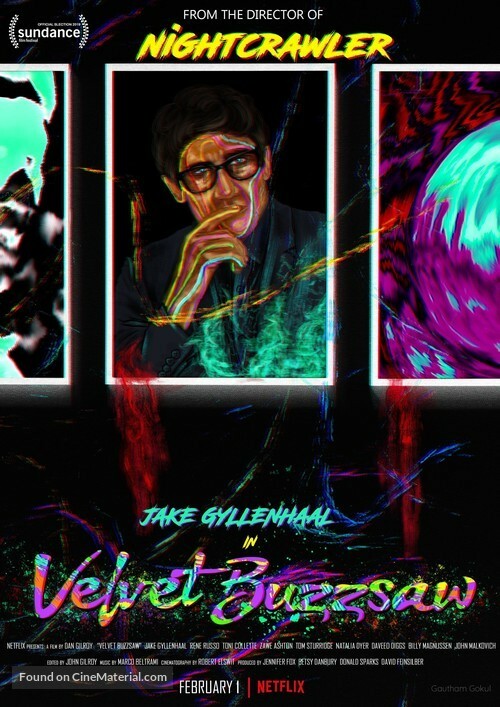 Velvet Buzzsaw takes two disparate genres and succeeds halfway in making something distinctively cool. Art can be a lot of things at once; in this case, innovative and imitative. Photo credits go to goldposter.com, and express.co.uk. I’ve heard good and bad. Still going to watch it and see what’s what. It’s pretty disappointing, good start but for how original it begins, unfortunate that it devolves into a meh horror movie. I’m halfway through my review mainly because I’ve see-sawed back and forth with my feelings on it. I love the absurdity and the hard-nosed satire of the pompous art scene. But it isn’t without its flaws. Interested to see your thoughts. Love the originality of the first half, but the second half is rather repetitive. A real letdown this one! I definitely lean towards this opinion too. It’s half of a compelling movie, but I found myself disappointed with the second half, mow em down 1 by 1 approach. Nice review Jackson. It’s an odd movie. But I’ll take that over a dull one any day. Hated this movie, but that poster art is beyond awesome! Great review! It’s one of the more positive ones I’ve read about this movie, I think that it suffered from high expectations prior to its release (given the first movie of the director, Nightcrawler). I like how you highlighted the good things of the movie! I’m a balanced person, highlighting the good and the less good stuff!